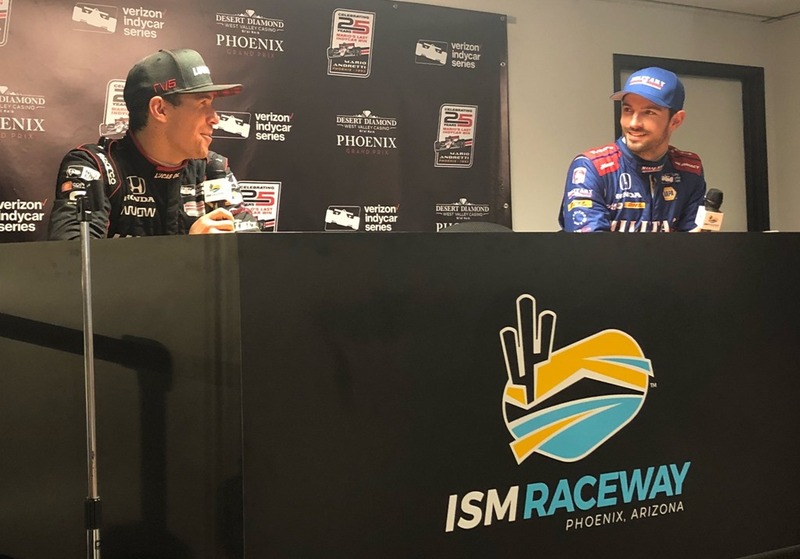 It took a while, but the Verizon IndyCar Series race at ISM Raceway in Phoenix on Saturday night became one that people were still buzzing about on Sunday. Early on, it did not look like that was going to be the case. About thirty laps into the 250-Lap event, I looked over at my wife, Susan, and said that it looks like it’s going to be another snoozer at Phoenix. I said that because once cars had spread into single-file after the start, there seemed to be very little passing. Even as the leaders caught the tail-end of the field on Lap 14, it seemed that the fastest cars on the track could not get past the slowest. That situation does not make for great racing. I feared another parade in the desert like we have seen for the last two years. The Tire Dragon, a contraption used to drag Firestone tires through the higher groove, apparently didn’t work. The hope was that the higher line would be available for cars to run up and pass, but it never really came in. The result was a one-groove race track for most of the night, putting passing at a premium. A lot of the hype going into this weekend was that Phoenix was a track built for Indy cars. The problem is that when the track was reconfigured in 2010, it was done so with stock cars in mind. Friday night, between the NBCSN Qualifying show and online practice, I watched the 1993 CART race from Phoenix that many kept referring to all week. That was the last win for Mario Andretti and it came at Phoenix. That race was frenetic. Early race leader Emerson Fittipaldi caught the tail of the field on Lap 7 and dispensed with them immediately. There did not seem to be a time when the leaders were not dealing with traffic and passing them, yet there were only two more cars (25) in that race than started the race (23) on Saturday night. The race on Saturday night saw the leaders not catch slower traffic until Lap 14, and they had trouble passing them. What does that mean in the grand scheme of things? I really have no idea, but thought it was worth noting. Even after the chaotic first round of pit stops, when Pietro Fittipaldi had a rude welcome to the series by finding the Turn Four wall on Lap 41 – things were somewhat static. It was still pretty much of a yawner – a single line parade that offered little passing. But around Lap 175, things got interesting – very interesting. Perhaps that’s when the sun went down and the race track cooled off, giving cars a little more grip and drivers a lot more confidence. I don’t know if that’s what it was or if it was a coincidence, but whatever the case – the race suddenly took on a whole new complexion. Things were still dicey up high, however – as Will Power had already found out on Lap 97 and Ed Jones would on Lap 229. But other drivers found out that you could actually pass at Phoenix, but you had a small window to get it done in each turn. Some drivers, Like Alexander Rossi, discovered it early. Others, like Josef Newgarden and Robert Wickens, found out later on. In the end, it was tire strategy that made the difference. The three cars of Wickens, James Hinchcliffe and Rossi that were running up front on the last restart were no match for Josef Newgarden, who passed two cars in one corner just after the restart on his way to the front. Wickens did well to hold off the hard-charging Newgarden for a few laps, but when Newgarden got tired of toying with Wickens he passed Wickens on the outside; effectively swatting him aside before he checked out all by himself into the lead and onto the win. During the past offseason, Josef Newgarden had been stating his desire to “Defend the 1”, referring to his champion’s Number One on his car. After two races he leads the championship by five points over Alexander Rossi, who finished third in his second race in a row. Robert Wickens finished second in his first oval race since his days of running in the Ontario Pro Challenge stock series in Canada in 2004 when he was only fifteen. This was the third year of a three-year deal between IndyCar and ISM Raceway. The crowd may have been slightly better than last year, but it was still sparse. By Lap 100, there was little action on the track and few people in the stands. I was beginning to think we were watching the last of IndyCar at Phoenix. But things got interesting and the race had a memorable finish. My hope is that there is enough buzz in the Phoenix area this week and as the IndyCar season goes on, that track president Bryan Sperber and parent company ISC will go against the recent ISC trend of bailing out too quickly on events, while IndyCar is still trying to establish something. IndyCar has deep roots in Phoenix. I think this race should continue and will ultimately draw decent crowds if given proper time to grow the event. TV Coverage: NBC reminded everyone why we were so happy when they were awarded the entire IndyCar contract beginning in 2019. As opposed to the four minutes to lead us into the season-opening race and the two minutes of post-race coverage that ABC gave us at St. Petersburg; NBCSN gave us an hour and a half qualifying show on Friday night, a thirty minute pre-race show and thirty-five minutes of post-race coverage. Leigh Diffey was as good as I’ve ever heard him, and Townsend Bell and Paul Tracy gave good insightful information without being too comical with each other. The only slight bobble I noticed was when they both acted surprised when Sébastien Bourdais came back in after he had struck his left-front tire changer on his first pit stop. They both exclaimed that he must have a problem if he was coming back in. I had already told Susan when it happened that he’ll be given a drive-through penalty for striking a crewmember. If it occurred to me, why didn’t it occur to them? Other than that, I thought the booth had a strong opening weekend. I also thought all three pit reporters (Marty Snider, Kevin Lee and Katie Hargitt) had good nights. They all asked good questions in their interviews and were on top of things. All in all, I thought NBCSN set the bar early in the season. Will ABC try to aim for the bar in their lame duck coverage at Indianapolis and Belle Isle, or will they just go through the motions? Let’s hope it’s not the latter. Goodbye, Verizon: Unlike when IZOD limped out of the series a year early, Verizon is fulfilling its five-year contract as title sponsor for the series, before exiting after the season. Overall, I think they’ve done a good job and they seem to be leaving on good terms with no hard feelings between the series or the fans. But the silver lining to Verizon’s departure means that we probably won’t be subjected to their commercials anymore during races – at least not like we are now. His bitter counterpart that he replaced, who now hawks for Sprint; may be a close second – but the annoying Verizon guy makes me want to change channels, even if I’m watching a Verizon IndyCar Series race. It’s either that or throw my remote at the television. It’s that bad. End of rant. End of Feud? After Saturday night’s race, Alexander Rossi showed some class when he crawled out of his car and immediately went to the car of Robert Wickens to congratulate him on a well-earned second-place. After they shared the podium, they were both in the media center for the post-race press conference. While in there, Rossi acknowledged “Rob should definitely have two podiums right now”. Wickens responded with “About time you said it”, which was followed by laughter. Rossi retorted with “You know, I needed to wait ‘til we were both up here, man”. 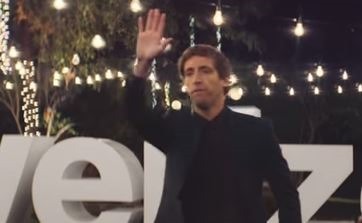 Is all forgiven? Rossi probably hopes so. I’m not sure he was all that comfortable in the role of the villain. But I think that Rossi made a lot of new fans along with his new enemies with that move in St. Petersburg last month. I’ve made it clear that I thought Rossi did no wrong by making that move. I saw it as strictly a racing incident. Others saw it as a dirty move. That’s what makes racing so much fun. Two people can look at the exact same incident and see it in completely different ways. The discussion is good for fans and for racing in general. But for his part, I’m betting that Rossi is hoping the whole thing goes away and is forgotten about, rather than having it brought up in every press conference. Pit Chaos: When the first caution came out on Lap 41, I remarked to Susan how close the first three cars were following each other on pit lane. Simon Pagenaud had the nose of his car up under the gearbox of Sébastien Bourdais, as the same could be said for Alexander Rossi to Pagenaud’s gearbox. Consequently, all three had horrendous pit stops. Was it a coincidence? 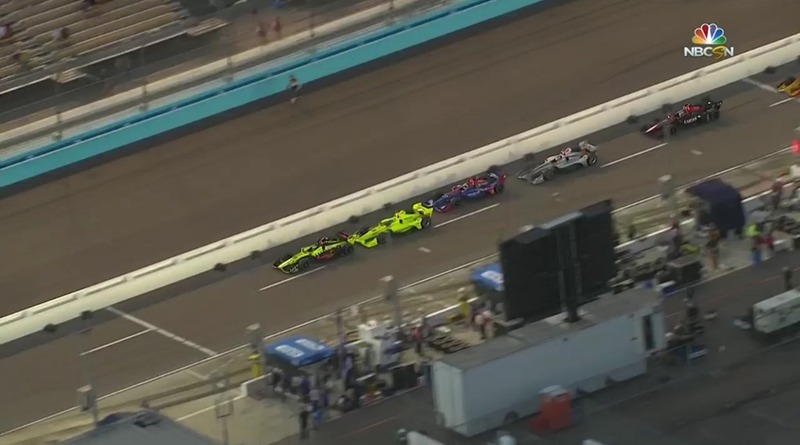 Bourdais and Rossi both struck crewmembers, while Pagenaud had a bizarre pit stop that saw him sit there while he was being motioned out very casually. OK, the following too closely had nothing to do with the way too casual pace of Pagenaud’s pit stop, which saw him enter the pits in second-place and leave in twelfth. But were the other two paying too much attention to the cars in front or behind and not enough to the pit box they were about to enter? It’s odd that such a thing would stand out so much that I would comment about it, before it led to disastrous stops for all three involved. The Foyt Team’s Undoing: It seems that each year, AJ Foyt Enterprises overhauls its team; getting new drivers, engineers, team managers or strategists. They can get the best in the business, but if they can’t execute a pit stop, what’s the point? Saturday night was the latest in a long line of botched pit stops by the Foyt crew. Matheus Leist, driver of the No.4 ABC Supply Foyt car, was making his second pit stop when his left-rear wheel came off as he was exiting pit road. Replays showed him being motioned out by his crew as the left-rear tire changer waved frantically, in vain, that he wasn’t done. The car went about a hundred yards before the wheel came off and rolled harmlessly down through the pits for about another fifty yards, before settling out of harm’s way. Leist was eventually pulled back to the pits, given a new tire and was sent back out. He finished nine laps down. How many times have we seen this play out? I remember several times when Vitor Meira would drive a fabulous race for Foyt, make up several positions in a stint, only to see them evaporate due to a botched pit stop by his crew. This is why I cringed when I learned that Tony Kanaan was headed to Foyt. I can imagine a scenario when Kanaan is leading a race and in a position to win, only to have a crewmember forget to attach a wheel-nut. Kanaan will see his wheel and certain race win rolling away through no fault of his own. Team leadership means nothing without the frontline guys who can execute flawless pit stops. If you’re going to save pennies on budget level crew guys, you get what you pay for. Slow Trigger: For the second race in a row, IndyCar has been slow to pull the trigger on the yellow flag and I see that as a good thing. When Matheus Leist lost his wheel, I was expecting a yellow flag. Not because I thought it needed to be thrown, but because that’s what IndyCar would have done in the past. Ditto for when rookie Kyle Kaiser brushed the wall on Lap 176 or earlier when Will Power slapped the wall a little harder. In the cases of Kaiser and Power; both hit the wall hard enough to take them out of the race, yet the race stayed green. This will apparently be the mode of operation for new IndyCar Race Director Kyle Novak, and I applaud it. When it comes to safety, there are those who think that there is no such thing as being too careful. I disagree. While I don’t think IndyCar should ever gamble with driver’s lives, I do think that common sense needs to come into play. Bringing a race to a crawl for ten laps or more because someone grazed the wall or a tire is out of the way leaning against the pit wall, is not using common sense. Consequently, there were only two yellow flags thrown in Saturday night’s race – once when the car of Pietro Fittipaldi stopped on the track after brushing the wall on Lap 41, then when Ed Jones slammed the wall hard on Lap 229. Both were obviously very justified. My only complaint? Why did it take so long for a restart after the cleanup from the Jones crash? I know that they were trying to run the sweepers to get the track as clean as possible. But by doing so, they were robbing drivers and fans of valuable racing time. IndyCar seems to be making a conscious effort to cut down on the amount of yellows. Now they need to work on cutting down the amount of laps for each yellow flag. Drive of the Night: Many drivers had notable evenings Saturday night, but one driver was clearly superior to the others. Josef Newgarden made a gutsy move for the lead and the win on Lap 247, after his crew made an equally gutsy call to pit for new tires under the yellow. I’ll admit, I thought they had made a mistake giving up the lead for new tires with only a handful of laps to make it back up. I was wrong. Ed Carpenter had an impressive night as he very quietly moved from his eighteenth starting spot to finish seventh. Scott Dixon did even better by moving up from starting seventeenth to finish fourth. Robert Wickens continued to impress by qualifying sixth and being up front all night. He did a good job in holding off Newgarden in the last few laps before his worn tires gave way to the fresh tires of Newgarden. Still he held on for a strong second-place finish. But in my opinion, no one had a night quite like the night Alexander Rossi had. Rossi started fourth and was running third, when he was penalized for running into a crewmember on his first pit stop. He was at the back of the field and a lap down, but fought his way back to the front by racing on the track – not by pit strategy. Rossi passed fifty-three cars during the night, that’s nineteen percent of all the passes that took place Saturday night. For comparison’s sake, race winner Josef Newgarden passed fifteen cars all night. Alexander Rossi put on a clinic, especially for someone who had never driven on an oval until two years ago. As the commentators stated the other night, Rossi’s apprenticeship is over. He is now a serious contender for the championship. His talent was on full display for others to see. When the other drivers go back and watch this race, they would be wise to notice Alexander Rossi. He and Robert Wickens are the next big thing to go along with Josef Newgarden who became a big thing last year. The future of IndyCar is looking bright. All in All: With the future of IndyCar at ISM Raceway in Phoenix hanging in the balance, things were not looking bright as Saturday night’s race got off to a slow start. Maybe it was the unforgiving track, or drivers shaking off a little rust from a one-month layoff or a combination of both; but the first part of Saturday night’s race was not edge-of-your-seat excitement. But somewhere along the way, we noticed that Alexander Rossi was driving the wheels off of his car and passing a lot of cars on a track that everyone said you couldn’t pass on. Not only that, he was making it look easy. But he wasn’t the only one. A lot of drivers seemed to wake up at the 175-mile mark, and suddenly – we had an exciting race on our hands. IndyCar should be back at Phoenix next season. That doesn’t mean they will be, but they should be. IndyCar has done what they need to do, now it’s up to ISM Raceway and the Phoenix area fans to do what they need to do. All we can do is wait for the verdict late this season. But if ISM Raceway was looking for an entertaining race before making a decision, they got one Saturday night. This entry was posted on April 9, 2018 at 4:04 am and is filed under IndyCar. You can follow any responses to this entry through the RSS 2.0 feed. You can leave a response, or trackback from your own site. George, one big, annoying factor of the NBC broadcast was the audio. One could barely hear the announcers over the sound of the on track cars zooming around. I don’t tweet, but how do others feel about this? George, can you pass it along, otherwise I will regrettably be forced to turn the sound down and listen to the radio broadcast. Thanks. All was fine on my end, using UVerse in Indianapolis. I had the same problem and it was more than annoying. F1 on ESPN Sunday was much better audio-wise. Luckily it ended up being exciting at the end thanks to a caution and differing tire strategies but it was a snoozer for most of the night. Hope they can figure out a way to get a second line going. The only issue I had with NBCSN was qualifying interview with Sébastien Bourdais when Marty Snyder called him Simon. I really enjoy how they will show the racing back in the field. I continue to be amazed that in races where tire wear proves to be significant that many teams still don’t order their cars to the pits the moment the fuel window opens. Getting on fresh tires ASAP has proven to be THE strategy at Texas since 2012 and it was apparent early on that it was THE strategy to use at Phoenix on Saturday night. Late race tire strategy circumstances aside, the action was improved over the last two years, though not by the margin I was hoping for. Still, I would definitely welcome Phoenix back next year. Same, on all counts. On Saturday night, we saw…a motor race. I enjoyed it. I liked Robin Miller’s piece on Sebastien, but still missed the grid run. I totally agree with both things.